10th Gathering of RILAN • Celebrating Los Diez y Los 30! We have a lot to celebrate. Join us as we kick off a year-long observance and celebration of RILA’s 30th birthday. For details see below. It’s not just our 10th RILAN gathering, but it’s also the 30th Anniversary of RILA. We’re excited to celebrate these accomplishments: The Emerging Visual Artists Program, Teatro Latino | Rhode Island, the addition of a Performing Arts Programs Coordinator, Latino Books Month Coordinator and the relocation of La Galería del Pueblo, the state’s only Latino Gallery and Cultural Center! Cultural resistance is a way of reclaiming our humanity and celebrating our work as individuals and the community around us. Cultural resistance can inspire us to own our lives and invest in our communities, while building commUNITY through the arts. It can come in the form of creative and artistic expressions that provides a fun yet meaningful way for people to get involved. On September 13, 2018, these three Latinx artists will be participating in a cultural resistance hosted by RILA. Each will share personal responses to events and movements happening in Latin America, around the world and in our own back yard. The event is free and open to the Rhode Island arts community. Space is very limited, so be sure to register above to attend. +✦ December 2, 2016 • Rhode Island’s only Latino Gallery! +✦ February 20, 2016 • Let’s Go to the Theater! Enjoy the show. A limited number of complimentary tickets *NO LONGER AVAILABLE, but you can purchase at a discount rate (see right for details). Tickets include a post-play reception and opportunity to attend a panel discussion immediately after the show with RILAN member artists: Analía Alcolea, Saul Ramos Espola, Maritza Martell and Marianne Ruggiero. Thank you to our community sponsor. Bilingual panel discussion following the performance will be moderated by Christina Marín, Assistant Professor of Performing Arts at Emerson College. Additional tickets available at discount rate of $15 ea. Click on the button below to purchase - AVAILABLE ONLY UNTIL FEBRUARY 17th. You will not be able to purchase discount tickets at the door, so advance payment is required. +✦ September 18, 2015 • Jam It Up! Featuring Lorena Garay, world renown cuatro musician. The purpose of this next gathering is to meet-up, talk, enjoy and make some NOISE! Open to professional musicians who want to jam. ➤➤ Click here to see photos and a video of this jam session. 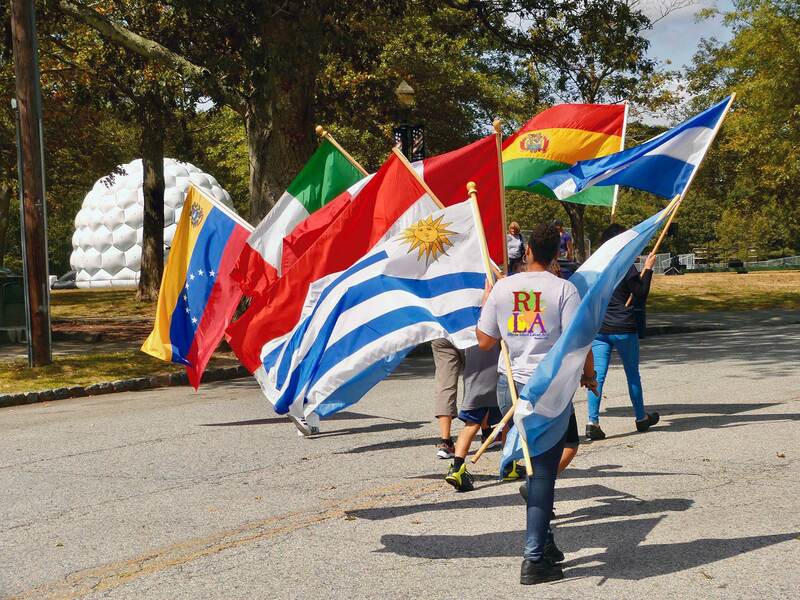 The RI Latino Arts Network was created in 2013 to support, create and stimulate artistic activities and cultural interaction among Latino artists and non-Latinos. This is the 7th networking event that RILA has hosted, and it is open to all Latino artists listed on the RILA Latino Artists roster and new artists who wish to sign up and participate. The purpose of this next gathering is to continue our discussions proposed in the 5th and more recent gathering on September 11, 2014 and to take matters one step further! This promises to be a fun an interactive night! Latino artists please come ready to show us what you're made of. You will have five minutes each and we need to know in advance if you want to be on the agenda. Visual Artists: Bring an art piece and tell us what inspires you when you create. Performing Artists: Prepare a short performance piece (dance, music, a short monologue or poetry out loud). Arts administrators of cultural groups and organizations: Tell us your goals, dreams and how we can help with collaborations. You DO NOT have to give a presentation to participate. ALL are welcome!